Before Tune-bot, I tuned my drums by ear, of course, trying to match my toms to drum voices on my electronic kit, or to sound clips of various drums on the web. I got pretty good at getting consistent tone across lugs, except with my floor toms, where overtones throw my ear a bit. But, I wasn't dialing my drums into musical notes, and I wasn't tuning my toms to intervals that made sense musically. My band covers "Melt With You" by Modern English, which has a distinct floor tom ride, and my bass player grimaced every time we played it. Then I discovered Tune-bot. After tuning my 14" floor tom to 2g, I got the "thumbs up" from my bass player. Now, all of my drums are precisely tuned, and my drum kits have never sounded better. When using Tune-bot, you dial in lug frequencies (i.e., frequencies observed when tapping a couple inches away from each tension rod/lug) to specific values, while achieving consistent frequencies across the lugs, in order to achieve an overall note for the drum (i.e., the frequency observed when hitting the center of the batter head on a freely resonating drum). The lug frequencies required to achieve the desired overall note will vary from kit to kit due to differences in drum shell depth, thickness, and composition, so expect some trial-and-error as you figure out the relationship between lug frequency and overall frequency on each of your drums. See the tables below for Tune-bot tuning schemes for several different drum kits and music types. The frequencies listed are the result of dozens of hours of fine-tuning drums in the rehearsal studio. Tunings are listed by drum, starting with the desired overall note and frequency, followed by the frequencies at the lugs for both resonant and batter heads. All toms and bass drums are fitted with 2-ply batter and 1-ply reso heads. After the drum kit schemes, you will find tunings for a variety of snare drums. All snare drums wear 1-ply coated batters with 3mil snare sides. PDP X7 thin-shelled maple kit with higher tom pitches for pop/dance/fusion music. PDP FS thin-shelled birch kit with lower tom pitches for modern rock music. Getting classic rock sounds out of a PDP X7 thin-shelled maple kit in fusion sizes. Tuning a vintage Slingerland 3-ply kit in standard sizes for classic rock. Tunings for a variety of snare drums and notes. Make sure your heads are seated properly--improperly seated heads cause a lot of tuning and choke problems. You have experienced this issue if you have ever heard a head "pop" or "crackle" while tuning, and afterward the sound of the drum really opened up. If your snare drum tone is dominated by dull thuds from the batter head and harsh slaps from the snare wires, re-seat the heads and listen for the shell to begin adding body to the mix! For more information on seating, see "A Note About Seating" below. Bring the head up to a reasonably even tuning by ear first, using a cross-lug tuning sequence. Starting from a reasonably even tuning helps reduce overtones that cause "phantom" frequency readings on the Tune-bot. Muffle the head you are not currently tuning--I usually rest the drum on a cushion to muffle whichever head is on the bottom. Tune the reso head first--I find it more convenient to dial in the final note on the batter side. When tuning the reso head of a snare drum, (a) remove the snare wires or insert a stick between the wires and the hoop, and (b) if the snare bed is deep, back off the tension on the four lugs adjacent to the bed. I usually leave these lugs about 20Hz-30Hz lower than the rest of the lugs. This prevents the reso hoop from bending down into the bed and also allows for more contact between the snare wires and the head. Ideally, you want to tune snare drum resonant lug frequencies to a perfect fifth (1.5 times), perfect fourth (1.33 times), or major third (1.26 times) higher than batter lug frequencies, keeping in mind that Tune-bot recommends against exceeding 400Hz at the lugs with thinner (2-3 mil) snare side heads. Once you get a lug near the desired frequency, press the "Filter" button on your Tune-bot so it ignores overtones. Otherwise, Tune-bot may pick up overtones, which will cause varying frequency readings for the same lug at the same tuning. The Filter function is a huge help in screening out those "phantom" readings. This takes a bit of practice--if you are tuning a lug to 220, and you believe you are close but Tune-bot is reading 205 on one hit and 130 on another, press "Filter" the next time you get a reading near 205. I use the "Filter" function on the way up to the desired frequency as well to check for consistent tuning across the lugs. When tuning larger drums, you will have to move the Tune-bot closer to the lug you are tuning--I've found that I can't leave the Tune-bot in one position on the hoop when working my way around larger drums. With drums up to 14" in diameter that are close to the desired tuning, I usually tune half the lugs from one Tune-bot position, and then I move the Tune-bot to the opposite side of the drum and tune the remaining lugs. With 16" and larger drums, I usually hold the Tune-bot directly above the head at each lug. When checking the overall note of a drum, be sure you are not touching either head or putting tension on a hoop and accidentally altering the note--if practical, place the drum on a stand. Then, hold Tune-bot over the center of the batter head and hit the drum. Tune-bot will return the overall frequency or note (you can toggle between the two readings using the "Note" button). If you are checking the drum close to other drums, sympathetic vibrations could throw off your readings. When possible, check each drum's note away from other drums, or muffle the nearby drums. Remember that each drum shell resonates within a limited frequency range. If you tune the drum outside that range--too high or too low--the drum will sound "choked." The fundamental note of the shell is the frequency that generates maximum shell resonance. DW actually stamps the fundamental note on the inside of each of its shells, but you can hear it by tapping the shell in a quiet room with the hoops and heads removed. As always, be careful with your bearing edges! It's all too easy to ding an edge when changing out heads. Uneven bearing edges are a common culprit behind tuning difficulties and poor tone. "Seating" drumheads is a procedure that involves placing weight on a new drumhead in order to (1) pre-stretch the head to reduce the need for re-tuning over time, and (2) form the head to the bearing edge of the drum to improve the transfer of energy from the head to the shell. It is a controversial process--many drummers swear by it, while others insist it is an antiquated process carried over from the days of calfskin heads. The actual seating process is something like performing drum "CPR"--pressing your palms down on the center of a drumhead and performing two or three "compressions." In my experience, moderate seating of new drumheads does help them remain in tune after playing and will help bring the tone of the drum shell into the mix. Whether seating is necessary or not depends on the specific combination of drumhead and drum. I have found that Remo heads typically require seating, while Evans heads often tune up initially and stay in tune without the seating step. The improved collar design on the new Evans 360 heads seems to reduce the need for seating even further. However, some drums, such as my Ludwig Acrolite snare drum, require attention to seating regardless of the make of the drumhead in order to achieve the bearing edge contact necessary for the shell to sing! Snare heads are too thin to seat--they could be damaged by the seating process. To seat any other batter or resonant head, first, bring it up to an even, medium tuning, and place the drum on something flat and sturdy--I usually use the floor. Then, spread the palm of your hand across the center of the head, rest your other hand on top of the first, and perform two or three downward compressions, using the weight of your upper body. Always use your palm--not fingertips, knuckles, etc.--so you do not direct too much weight to any one point on the head. Also, take care to prevent watches, bracelets, and rings from coming into contact with the head. Some of the glue in the drumhead collar, especially with Remo heads, may "pop" and "crackle" as you place weight on the head--this is expected. I do not recommend standing on the heads of larger drums as some suggest. Seating compressions can de-tune both drumheads--the top head, of course, but the bottom hoop can press upward as well, stretching the bottom head slightly--in that case, you will need to tune both heads back up to the desired note. 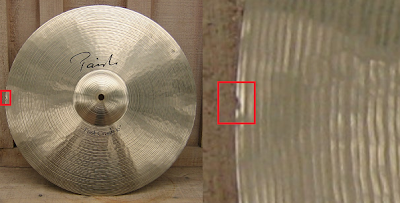 Don't be afraid to repeat the process to obtain the bearing edge contact necessary to bring out the drum shell's tone. 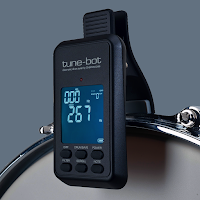 After using Tune-bot for a while, I thought it would be cool to see other drummers' Tune-bot settings, and when I searched for them on the web, I ended up at Tune-bot's site. Check out http://tune-bot.com/drum-tuning.html. This page provides great information on overall notes for various drums, and offers tuning approaches for toms, snares, and bass drums. Tune-bot's lug frequency calcs were off a bit, at least for my kits, so I've shared the "street" lug frequencies I've worked out over the past several months to achieve the desired overall notes. Be sure to check out http://tune-bot.com/artisttuning.html for several pro tuning schemes. Also, you can find Tune-bot threads on many of the major online drumming forums, although you may have to sift through posts from drummers who are new to Tune-bot and haven't gotten the hang of it yet. Last but not least, if you want a deeper understanding of the physics behind drum tuning, check out The Physics of Overtones at circularscience.com. Take the time to get used to tuning your drums with Tune-bot. Once you hear the amazing tone your kit can produce with properly tuned drums, you will enjoy playing them more--and you will stop drooling over that DW kit you've had your eye on. For some reason, drummers have a tendency to accumulate snare drums. To be sure, differences in drum diameter, depth, shell materials, and even hoops will result in differences in tone. But when my wife asked me the other day how many snare drums I owned, I quickly responded, "six--wait, seven--no, actually nine. But one's for sale!!" The first two snare drums were included with with my PDP kits--a 5x14 thin-shelled maple in the same red-to-black sparkle burst lacquer as my PDP X7 kit, and a 5.5x14 thin-shelled birch that matches my natural-to-charcoal fade PDP FS kit. These snare drums when equipped with quality heads actually tune up fairly well and would work well in a pinch. But neither is able to produce the kind of tone that makes you smile as you play. I'm keeping these two drums mainly so that I have complete PDP kits if I ever decide to sell them--I mean, how can you sell an X7 kit with only six drums?! The first snares I purchased to upgrade my PDP kit snares are my beloved Slingerland 6.5x14 chrome-over-brass units that I picked up on eBay. One dates back to approximately 1975 and includes the less-desirable Zoomatic throwoff, and the other is a 1979 model with three vent holes and the smooth and reliable TDR throwoff. As readers of this blog know, I learned to play drums on Slingerlands, and I think Slingerland's brass snare holds its own against the legendary Ludwig Supraphonic. When you consider that you can pick up a Slingerland 6.5x14 chrome-over-brass snare on eBay for about half the price of a Supraphonic, the Slingerland is clearly an excellent value. The one drawback of the Slingerland is that its shell is not as rigid as the beaded Ludwigs, so it is prone to what I call "lug denting"--setting the drum down edgewise can cause the lugs to press into and dent the shell. Most of the used Slingerland brass snares I have seen have at least some lug denting, so examine the photos carefully before you buy. While minor dents can be carefully hammered out with a rounded block of wood, that process can cause the gray coating inside the shell to flake off--better to find a relatively dent-free drum. I mentioned my next two snare drum acquisitions in previous blog posts--first, a new PDP 6.5x14 20-ply snare with a maple/bubinga shell. Like most PDP offerings, this is a very reasonably priced drum and it provides all the projection and crack you would expect from a thick-shelled wood snare. The included DW mag throw off is a great design, and, if you are in the market for a throwoff upgrade, very reasonably priced at about $30. I love the tone of this drum for modern pop/rock songs, and the stained and lacquered bubinga outer ply makes it easy on the eyes as well. The second snare I covered in a previous blog post is my used Rocket Shells 8x13 carbon fiber snare, a drum that surprised me with its awesome tone and looks. This drum is proof that there are excellent deals to be had on eBay! In addition to the Slingerlands, I learned to play drums on one other classic model--the aluminum-shelled Ludwig Acrolite. For 2012-2013, Ludwig is manufacturing "reissued" Acrolite models, and I recently picked up a 6.5x14 "Classic" (chrome hardware instead of the "Limited Edition" brushed hardware) on eBay at a good price. The Acrolite is essentially the same drum as the aluminum Ludwig Supraphonic without the chrome plating--and without the pitting and peeling that plague used Supras (chrome doesn't bond as well to aluminum as it does to brass). Typically priced lower than the Supra, the Acrolite is great addition to any drummer's arsenal. Different metals have different tonal characteristics. The differences are less subtle than you might think. For example, in my experience, steel shells produce the most ring, brass shells produce moderate ring, and aluminum shells produce less ring, what some drummers describe as a "drier" sound. By "ring," I'm not talking about undesired overtones, I'm talking about the way the metal shell resonates near the sweet spot of its tuning range. Steel shells ring, and sometimes that's what you want! But aluminum is on the other end of the spectrum, offering the power of a metal shell with a drier tone, somewhere between brass and the brighter wood shells. That leaves one drum left to cover in my snare collection...my Mapex 3.5x13 steel piccolo. This model usually runs about $70 new, but you can find deals on this drum as low as $49. A steel piccolo tuned up high has a great crack and just the right amount of ring. The throwoff on this drum is not very smooth, but it gets the job done. So, that's the rundown of my snare drum arsenal. Hopefully my wife will read this, although I'm not sure it will help. Oh well...what snares are the favorites in your collection?